I live in an Adventist home. It doesn't look a lot like anything described in little red books. But that's what it is, because Adventists live here. Adventist homes, and the families that live in them, are changing. We don't look like the model families from the 1950s, and frankly we are skeptical that those families ever really existed. My theory is that life has always been hard. None of us live by the book, or fit the image. And that's true for all of us--not just people sitting next to you in the pew, but also the people who stand in front of you. I know. My husband Jim is one of them. In fact, I know a whole lot of pastors and church workers--studied with them at the seminary, corresponded with them over the trials of parenting. A remarkable number of us drink coffee, and have seen the inside of a movie theater. Our kids can name the characters from Disney shows. And we're Adventists. We care about our church and we're passionate about our faith. We're here because we believe in it, and we work for the church with our whole hearts. We belong to this faith and, more importantly, it belongs to us. We are the other Adventist homes. And that's why I'm sticking around. It's a pretty chaotic time for this denomination. The issue of whether to ordain women who pastor in the same way we do men, has gone from a hot topic to a burning one. If it's possible, we are even more polarized than the American voting public. And the "antis" who hold the General Conference right now, are just not sticking "Coexist" bumper stickers on their cars these days. The denomination is going places I don't support. So why am I still here? Because I'm an Adventist. Church administrators come and go, and they don't get to define what it means to be Adventist. In fact, that's what it means to be Adventist. This denomination began with a bunch of apocalyptic misfits who had been largely turned out of their own churches for believing in the (very) soon return of Jesus. In the beginning, they had only that one thing in common. In time, they found more in common, like the seventh-day Sabbath and the unconscious state of death. But they weren't crazy about creeds or tests of faith. And they were bound by loyalty only to the Bible. The Fundamental Beliefs, however respectable, don't make someone an Adventist. That comes from a few simple beliefs, a loyalty to Scripture, and the choice to belong. So I am sticking around. Because I believe our denomination is better than this fight we're in currently, and we will be better again. And because I believe in these other Adventist homes. I believe it's us, and not the 1950s image who are going to be the church's future. If it has a future, it's going to have to be us. We are Adventists. And this is our home. Yes, yes and yes. Thank you for the honesty here. We are also an "other" Adventist home and I wouldn't have it any other way! Does this mean E.G.White is no longer pertinent in our Adventist life styles. Meat Eating, coffee drinking is no longer part of our health message. I can call myself Adventist cause I church on Saturday, but everything else is do as you please? It's sad that these health guidelines ever gained the central place that they did. That imbalance has distracted the faith from its incredible focus. Understood in context and practiced with the balance intended, the health principles expressed by Ellen White are blessings from God but they do not define what an Adventist is. They did not for our pioneers and I hope they do not for us. Gen. 9:1 And God blessed Noah and his sons and said to them, “Be fruitful and multiply and fill the earth. Gen. 9:2 The fear of you and the dread of you shall be upon every beast of the earth and upon every bird of the heavens, upon everything that creeps on the ground and all the fish of the sea. Into your hand they are delivered. Gen. 9:3 Every moving thing that lives shall be food for you. And as I gave you the green plants, I give you everything." I think if all you eat is meat 24/7, you most likely are going to have the symptoms of what Mrs. White said: lethargy, sickness, numbness in the mind. But please remember: meat eating itself is not somehow contrary to God...because He is the One that introduced us to it! There is much more to Ellen White's message than meat eating and coffee drinking. I lived under many years of Communist oppression. We were consistently persecuted for our Adventist faith. We were willing to go to prison before renouncing to our Adventist principles and many of my friends even ended up being tortured. My fellow Adventist brothers and sisters and I believed 100% in Ellen White's spirit of prophesy. But we also ate cow's meat and chicken because we could not find enough vegetables in the country to eat a balanced vegetarian diet. Did that make us less Adventists than the hard-line, vegan Adventists from North America? Absolutely not! I would like to see if some of those who make vegetarianism and veganism the central part of their gospel would be willing, with the same passion, to be tortured and die for being Adventist. Wonderful! Thank you for putting this out. It's not just about healthy eating and living a more healthy lifestyle or that we go to church on Saturday (like our Jewish friends) or that we have chosen to have our own schools, businesses and social functions...what makes us Adventist is that we have chosen to live differently, live according to our beliefs within a world that may not believe. We choose to stand defiantly as soldiers of God to share our beliefs with others through ridicule and ostracism. Now we are concerned about ordaining women when this religion was founded and built around the prophecies of Ellen G. White - a woman??? Our worst enemy is ourselves...We cannot remain unchanged but must grow with the changing world keeping our key beliefs intact. We are not the only answer to living a beautiful and dedicated life in his image. The road to heaven will be walked with saints and sinners alike whether they smoked or drank or ate meat or went to church on Saturday. It's what is in our hearts that matters. Being Adventist means sharing that compassion and love with all who cross your path. The issue with ordaining women is not an American issue, but more a world-wide church issue. Some countries still do not recognize women as equals, much less able to lead. Well said. We have room in Adventism for diversity. We can all work together to show the world what it means to follow God, decaf or non. I'm married to my wife. I don't think I look like what other married men looked like back 50 years ago, but then I'm not sure they ever really existed. If I'm in the mood, I go out at night and visit one of my girlfriends. Oh, some of you antis might not like that, even in this enlightened age, but then, you may not always have a say in those things. People like me will always be here while you come and go. I'm a married man, no doubt about it, and I know there is room for diversity. This makes me sad. How can we say the Bible and the SOP are no longer relevant? "This denomination began with a bunch apocalyptic misfits....."??? I came out of Mainline Protestantism attracted to a gospel that gave us power to, through grace, live a Godly life, though imperfect. I feel lied to by my Church. It is in the process of trying to give back the nominalism I came out of. If going to church on Saturday and believing in the imminent return of Christ is the only distinction it now has to offer, then I could have stayed where I was. Institutional Adventism: God help us. Judges 17:25 "In those days there was no king in Israel: every man did that which was right in his own eyes." This does not describe the life and devotion of Desmond T. Doss. Donald, don't give up your hope in the gospel. Jesus promises to give us the power to overcome the world. (John 1:12 Amp). The difference between the wise and foolish virgins is the wise virgins have the oil--Holy Spirit--and the fruits of the Spirit. By behold we become changed--our characters become like Jesus. We are filled with love, joy and peace. Remember the wheat and the tares grow together til the end. I agree with Donald R. Blythe. Don, I didn't read anywhere in the article or the succeeding comments that either the bible OR the SOP are no longer relevant. The way I read it - correct me if I'm wrong, please - was that the fundamental principles of the church, as originally founded (not the 28 that we now have), are our bedrock! We were blessed by Sister White's prophetic guidance on an all round healthy lifestyle, but that is not what is going to make us eligible for the kingdom. Matthew 28:20 is The great commission. How do we achieve it? By seeking first the kingdom of God and His righteousness! Because the whole health message is not observed by Everyone in the church around the world! But that doesn't exclude them from God's love and grace. That's not the criteria for heaven. The criteria for heaven is Jesus. Follow Me, he said… He didn't say anything about caffeine, exercise, clothing, hair, makeup, smoking, dancing, etc. We have a common mandate to embrace these things, but they don't hold the key to heaven. Fortunately though, it's not for us to critically judge this. Give it to God. He's got this! Don't leave. Where will you go, and why? Wheat and Tares was said by Teamworker, the job of shifting is not ours. Go With God. Where do I fit along the scale of all that's been said here, in article and comments? 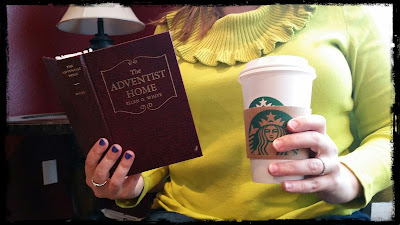 An Adventist whose parents read the little red books, told me not to avoid caffeine, and I did. They didn't emphasize exercise, so I avoid it, they did instill a love for Jesus, which I have. They did give me a love for Sabbath and it's boundaries, which I follow. We are all a mix of good, bad and badder and God is our advocate, encourager and judge -Adventist, yes, independently standing before God, yes, in love with the traditional Adventist message - for the most part, a supporter of Women despite many current views - definitely. A daugher by design - Amen!